Remember Ian, the “vegetarian body builder” who last November took on a seven-week yoga challenge to change his body and his life? Forget 49 sweaty sessions in the hot room – Ian completed an incredible 108 Bikram Yoga classes in a row! Now he’s sharing the results – and the secrets to his success – with us! Why did you decide to keep pushing past 49 days? At first I didn’t even think about doing a challenge; I just wanted to lose weight and build muscle. The 49-day goal was mostly arbitrary. But, as I approached the end of those first 49 days, I started to understand that our bodies change slowly. So I decided to give myself more time and increase my goal to 108 consecutive days of Bikram Yoga. Why 108? For starters, it’s a number that carries significant meaning in Hinduism; also, the prayer beads I use each morning to meditate total 108. In the end, though, it wasn’t really the number that was motivating me – it was my health. There’s nothing more important in this world than our health – it’s our true wealth. I’d say the hardest part was the time commitment. We’re all busy with life; I’m no exception to that rule. So I simply decided to find the time. No matter what my schedule happened to include on any given day, I made sure to find two hours to do Bikram Yoga. That often meant I had to go to class early in the morning or late at night, but I did it. Fridays and Saturdays were especially challenging – I seemed to feel like taking a break most strongly on those two days – but after the first couple weeks I developed this incredible momentum that made the rest of the 108 days easy. The key to any progress is momentum. Eating well and staying hydrated in real time was also challenging. Bikram Yoga is a demanding practice that requires you to stay on top of your water intake and energy reserve. I realized early on how important it was to drink enough water and get enough nutrients into my system in the 12 hours leading up to my next yoga class. I started to experiment with different kinds of drinks, from protein shakes to orange juice, coffee, coconut water and yes, even beer! At one point I poured two cans of beer in my water bottle and drank that in class – something I really don’t recommend anyone else do! For all my experimenting I found that the best thing to drink in order to hydrate fully and functionally is coconut water, which has the perfect ratio of sodium to water and just the right amount of sugar (i.e., energy) to help push through the second half of class. When I wanted to cut the cost of the coconut water I would just eat a banana and drink a mixture of water and sea salt (1.25 grams of sea salt per 500 ml of water). Got any tips for people who want to try a similar challenge? Drinking pure water is actually delicious. I know lots of people who don’t drink water because they say they don’t like the taste but, honestly, nothing tastes more delicious in that hot, sweaty yoga room. So, drink lots of water! Don’t eat raw garlic before a Bikram Yoga class. Trust me, don’t do it. Don’t be scared of late-night classes. I personally love doing the 10 p.m. at Cambie: it’s less busy and you don’t have to fight the time limit in the parking lot. My favourite thing to eat after class is a big bowl of noodle soup. It’s low in calories and replenishes some of the water and sodium I lose in class. Keeping your sodium level up during class will help reduce any dizziness. Exercising not only makes your body strong – it strengthens your mind, as well. To make my practice “whole” I regularly end class by making a non-selfish prayer at the end of the final Savasana. No matter how difficult it may seem in the beginning, it’s just 90 minutes of your life. And, if you stay present and give it your best effort, those 90 minutes will literally fly by. I prayed that I wouldn’t get sick during my challenge, and it worked. A challenge is called a challenge because, well, it’s challenging! But it’s incredibly rewarding as well. It’s always easier to stay at home, but you end up growing every time you leave your comfort zone. Some of the toughest environments – like the hot room – provide the best opportunities to learn. 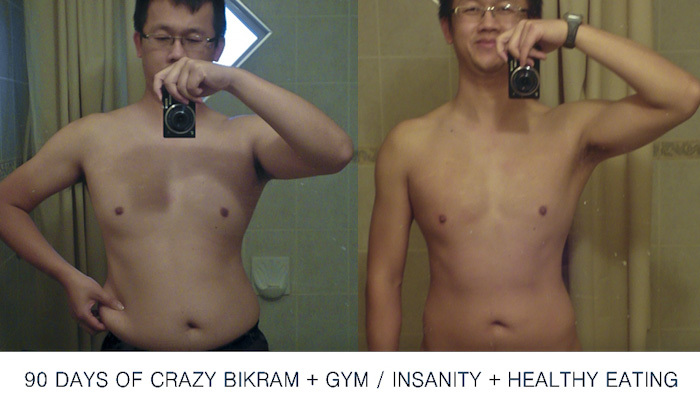 Not only did this challenge make my body stronger, doing Bikram Yoga every day forced me to change my life. I had to eat and hydrate well in order to make it through each class, so ultimately this challenge sparked an overall change toward better health. I also feel calmer, happier and better equipped to deal with the daily stress of living; this challenge really showed me that changing your body is changing your mind. To sum it all up: Bikram Yoga is life changing. Keep up with Ian’s continuing adventures! Follow his blog at www.easyfatloss123.com and take his journey with him from day one on his YouTube channel.